If you are a family caregiver to an elderly loved one, you may feel tempted to decline invitations to parties because of your responsibilities. However, with a little preparation, you and your loved one can enjoy social outings. As long as your loved one is healthy enough to attend an outdoor event (consider the sun exposure, heat, insects, and noise), and the host understands and is willing to accommodate any special needs, getting out and socializing is good for you and your loved one. If the menu includes food that may be difficult for your loved one to eat, bring some of his or her favorite dishes and serve them at the same time everyone else eats. You can even make enough of one of these dishes for everyone as your contribution to the meal. Be sure your senior is dressed in layers and bring an umbrella in case there is not much shade. Applying sunscreen is a good idea for both of you. At the party, help your loved one get settled in a comfortable location. If getting up and moving around is difficult for him or her, bring guests over to visit throughout the event. 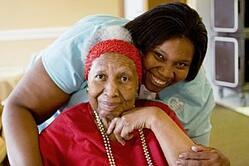 Ask other family members or friends to spend time with your elderly loved one so that you can move about and mingle. Be sure you know where the nearest bathroom is located and every once in awhile, discreetly check to see if he or she needs to use it. Dehydration can be a serious issue for seniors, especially in warmer temperatures, so ensure there is a glass a water within his or her reach. Above all, watch your loved one for signs of fatigue or discomfort. You may have to leave the party early, but it’s better to get out for a short time than to miss the fun altogether.